• PARIS — In his filmmaker guise, Karl Lagerfeld brings out the salt — and vinegar — in Kristen Stewart. While typecast by some for aloofness, the “Twilight” and “Still Alice” actress is all combustible emotion in “Once and Forever,” the 11-minute movie Lagerfeld plans to screen in Rome on Dec. 1 in tandem with Chanel’s latest Métiers d’Art collection. Tender one minute, exploding with anger and expletives the next, Stewart portrays a fiery young actress brought in to portray a young Gabrielle Chanel in a biopic — only to lock horns with practically everyone on the set. She reserves her affection only for the legendary fashion character she impersonates — and her costar Geraldine Chaplin, who reprises her role as the designer in her twilight years. In one of those fizzy mental puzzles only Lagerfeld can construct, his latest directorial effort is a movie about a movie that will be screened at the Eternal City’s hub of Italian film, Cinecittà — and in studio No. 5, naturally. “She’s beautiful, no?” Lagerfeld asked as he previewed the film exclusively for WWD at Chanel’s Rue Cambon studios. In the opening scenes, Stewart is seen in a ruffle-neck blouse and demure turn-of-the-century woolen suit, when the young Gabrielle Chanel was an aspiring stage performer, belting out songs — “Ko Ko Ri Ko” and “Qui qu’a vu Coco” — that earned her a nickname that stuck for life. 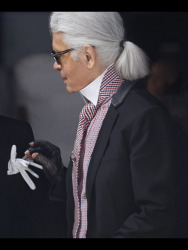 In an interview, Lagerfeld noted that “the final image of Chanel is the old lady” and not the vivacious and flirty Coco of the fictional biopic-in-the-making — if ever Stewart’s character would stop quarreling with the white-haired producer and the hyped young French director, played by Jérémie Elkaïm, who’s been brought in to realize the project. Lagerfeld said he conceived the film with Stewart in mind, convinced she could play the role of condescending, hot-tempered diva to the hilt. “Nobody wants to be with her because she’s so nasty,” Lagerfeld said as scenes flit between Stewart, sulking alone in her dressing room in a glittering vintage Chanel dress from 1919, and Chaplin, fawned over by members of the film crew as she’s seated in front of her makeup mirror. “She’s so good,” the designer enthused about Stewart, a front-row regular at Chanel, and a protagonist at last July’s casino-themed couture show, where celebrities were placed as the centerpiece of the show, feigning a game of roulette. He noted both actresses are quick studies, which he appreciates as he deplores the waiting and repetition often involved in filmmaking. Stewart learned that Lagerfeld’s filmmaking methods are unique — unorthodox, even. He conceives the entire movie in his head, dialogue included, and then doles out lines right on the set. “Once and Forever” was realized using four cameras at Luc Besson’s studios over two days. Indeed, the film has the polish of a Hollywood production: scenes jump rapidly with the gymnastic agility of Lagerfeld’s mind, and color images depict the film set, while black-and-white ones portray the fictional biopic portion. “I hate when they go on for hours. I think it should be short and sharp. 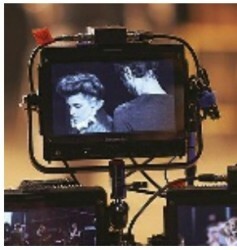 That’s the idea of the movie,” the designer said. 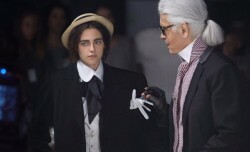 For her part, Stewart found Lagerfeld “supremely natural,” thoughtful and confident — all of which rubs off on the actors. “His interest in cinema is clear and working with him in that way was inspiring,” she said. This is his 20th mini movie for Chanel since 2008, always detailing a chapter in the founding designer’s colorful and intriguing life. It’s also a wry commentary on the glut of real biopics about Chanel, recent ones in France having featured Anna Mouglalis and Audrey Tautou. He also acknowledged that working within Chanel puts at his disposal resources and information not available to outside filmmakers. He certainly would not be up for a heavy subject. Meanwhile, Stewart has another starring role on the horizon chez Chanel: Lagerfeld is to photograph her for the advertising campaign for the Paris-Rome Métiers d’art.